The TCCB supports parental choice and we applaud Senator Taylor and Representative Simmons for honoring a parents’ right to choose the best education for their children. 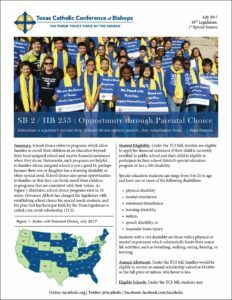 Their bills, SB 2 and HB 253, both recognize that parents are the primary educators of a child, and provide opportunities for special education children who have the greatest academic and financial need. SB 2 and HB 253 rightly recognize both the proper role of parents and the proper role of the state. The TCCB encourages the Texas Legislature to also adopt this view.